Tropical sunsets are the best. Shot at Tulaghi. 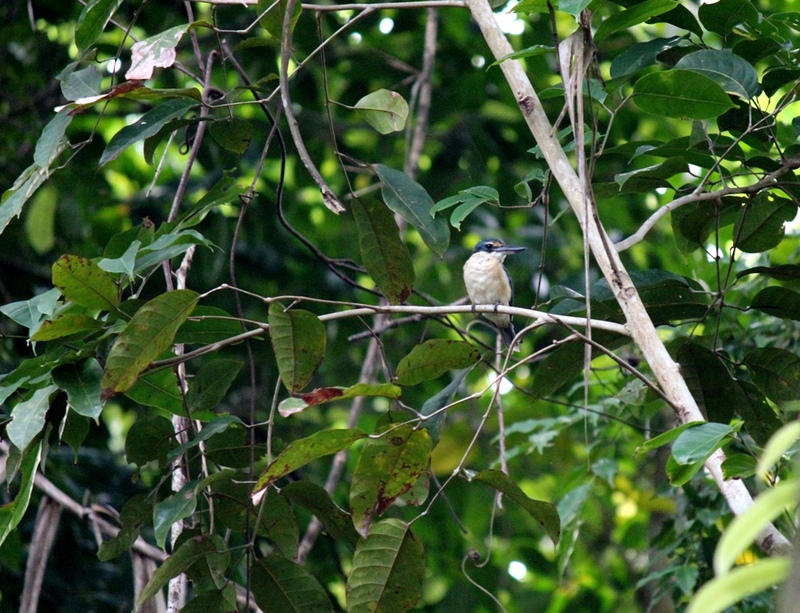 I apologize for the big blogging slump over the last month and a half, when I returned to Austin after a two month field season in the Solomon Islands. An extremely tight schedule, including visa appointments, a paper submission, three AGU abstracts and much progress on my Gulf of Mexico sediment cores, is to blame for this hiatus (apart from procrastination). It's been one hectic July for me! 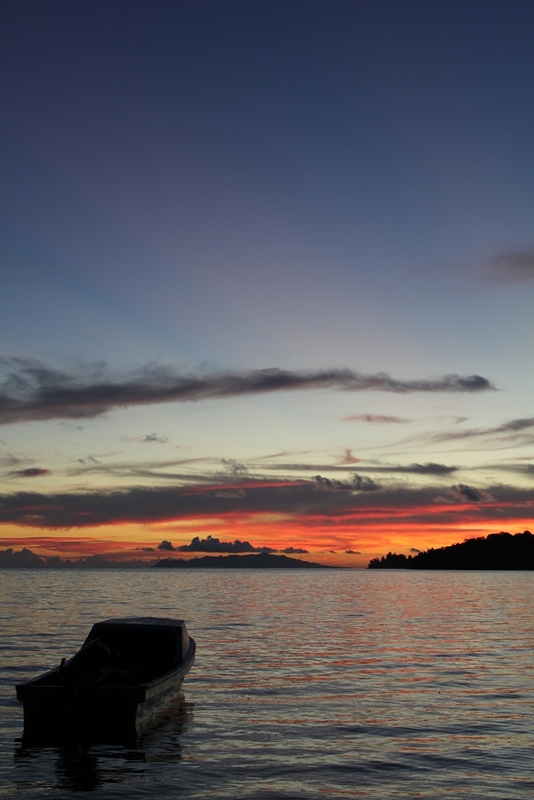 So, it is quite ironic that my subsequent blog post is from back in the Solomon Islands! We (Fred Taylor and I) left the Solomons in the last week of June after collecting many uplifted (dead) coral samples on land (with rock hammer and chisel) that were indicative of previous uplift events (earthquakes). We also found several huge (living) coral microatolls in shallow water that hold the keys to the amounts of vertical deformation pre-earthquake and post-earthquake. However, in order to read these microatolls, we need to cut them open - which takes more than a hammer and chisel. In fact, it requires a hydraulic/gas-powered drill/saw system - in other words, a lot of equipment (it clocked in at just over one tonne). Unfortunately, as things go awry when you're in the field, our equipment did not make it here last time and we were told that the shipment would arrive only two months later (it was sitting at the Brisbane dock waiting for a ship - the Kopoko Chief came to the rescue!) 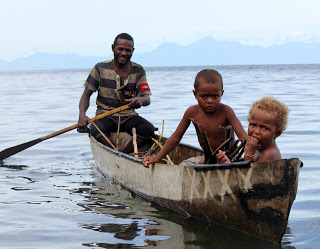 This is why we are back in the Western Province, Solomon Islands - and now, we have our equipment. Corals beware, we are armed! Jumping right into it, a week ago, we were in the Florida Islands, a short boat ride away from Honiara, and cut open a bunch of microatolls. As these islands are relatively devoid of neotectonic activity, these corals will aid us in seperating the oceanographic signal (ENSO, sea-level rise etc.) from the tectonic signal (deformation of the land, earthquakes) that we see in the corals of the Western Province. Hauling the hydraulic chain-saw around (the selected weapon of choice) was quite an ordeal but it was no match for the logistical mess that we would endure while leaving for the Western Province. Originally, we were scheduled to head west aboard the Pelican Express 2, a slick passenger vessel that would reach Gizo, our destination in the Western Province, in a mean 12 hours. This ship was to leave the Honiara dock at 7AM sharp on Sunday. All of our equipment (including the hydraulic chainsaw/drill, gas-powered chainsaw/drill and assorted tools) was at the Solomon Islands Geology Dept., a good 3km away from the dock. We were staying at the United Church Rest House, close to the dock. So, all we needed to do was: wake up early, wait for our truck (which we had already 'booked'), head over to the dept. and haul our equipment to the dock. Simple, right? On our part, we were awake and ready to go at 4:45AM. Our driver who presumably woke up late after a long night, reached the United Rest House at 6:15AM, after much pandemonium from our side while we had already tried to flag down several passing trucks (mind you, loading a tonne of equipment on a truck and unloading it takes a lot of time). But, finally, he had arrived! Crisis averted, right? Well, on the way to the Geology Dept., the truck spluttered, hemmed and hawed and finally came to an ominous stop a good kilometer away - it had run out of diesel! We were stranded on the way up a hill without fuel and without any passing traffic. It was 6:25AM. We still had a lot of work to do and there was only 35 mins for the Pelican Express to leave! Standing on that hill, forlorn and distraught, ultimately, we hypothesized about the worst-case scenario (not a bad thing to do when one does field work): we don't find a truck to the department in the next 15 mins, go get diesel from the nearest petrol bunk (a cool 5km away), drive to the Geology Dept., load our gear and get it to the dock, forget about the Pelican Express and look to board a later ship. And this was exactly how it played out, resulting in a loss of money and time. The Fair Glory took off from the Honiara dock at 10:00AM, giving us plenty of time to load our equipment and a long 27 hrs later, we made it to Gizo. At Gizo, we've been staying at the PT 109 restaurant - named after JFK's destroyer boat that was wrecked not far away, 70 years ago. 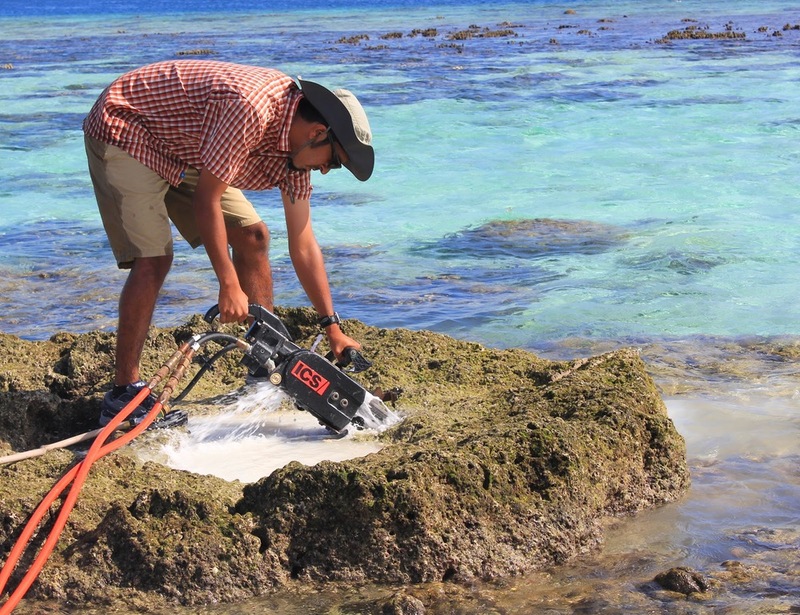 We've been here for four days, cutting and slabbing coral microatolls and it already seems like a month! Each day is a battle against the sun and those tough, tough corals. However, looking at a cut slab is like opening a present - you never know what you're going to get! Depending on internet availability, I'll try to periodically update the blog on the interesting geology we chance upon.